This non-invasive natural therapy is based on century old traditions. It is an energetic therapy that works by activating circulation and drainage in the area. Therapy is mostly used on ears. The ear cones operates through osmosis and/or convection. Ear (or also body candles) are no ordinary candles. They are made specifically for the purpose out of cotton flax stiffened with pure beeswax. A filter at the base of the candle prevents any wax or ash falling into to the ear or body. Their hollow design creates the drawing „chimney“ effect, which influences nerve endings, meridians and helps to remove toxins from the body. The candle is not inserted deeply or painfully, just firmly enough to create a seal all the way around to keep smoke from leaking out of the ear. To the healing process comes in phase of regeneration, between application of cones. For one day is recommended to have maximal 4 applications. 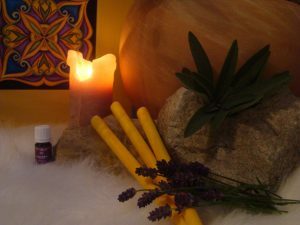 The beeswax candles can be used for ears and entire body. One session may or may not relieve your symptoms. I don´t applicate candles by intolerance to bees product, by injured or ruptured ear drums, in pregnancy, by varixices and after heart surgery.